It's our great privilege to present this downloadable Trainer version of the Free Modding P_36X - which just might be the 'most modded' aircraft in IL-2 history. Not only is she a trainer in the sim, she's a trainer in real life too: she and her P_36X brethren have been modified in dozens of living rooms and studies, by 'modding cadets' all over the world. This special downloadable version is brought to you by all the guys in the Free Modding community: FreeModder_One, Beowolff, Hunter, CY6, Ton414, and WarBird among others who have worked on her. Included is a Skins folder - be sure to check out the special 'Chieftain' skin by our good friend RDDR from Axis and Allies. 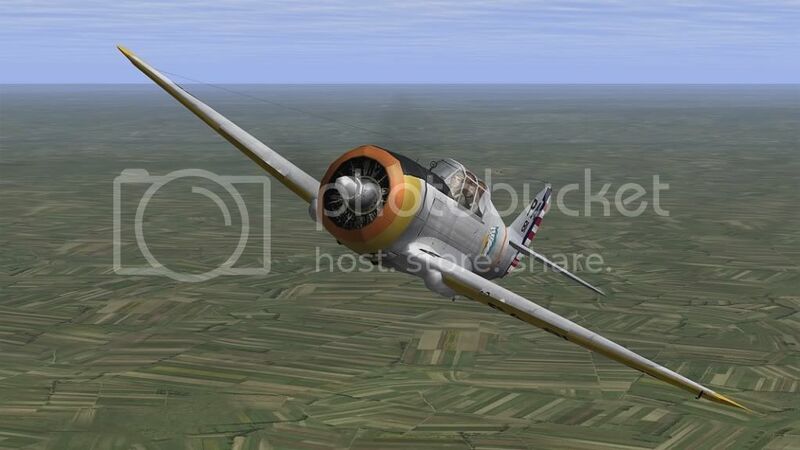 There's a small selection of other skins for your enjoyment - please note that many of the 'standard' P-36 skins available may be unusable due to distortion where the fuselage has been 'stretched'. She's all set to fly in 4.101 with a functioning two-place canopy, and includes a 4.09 FM file - you can convert this plane to 4.09 use by merely renaming the current FM file to 'old' or some other name...and replacing it with the FM from the 'included' 4.09FM folder. She has special 'federal budget' training issue loadouts - DON'T waste ammo cadet... the Government Accounting Office is watching! You need the 'correct' Diff_FM file to use this plane. Drop the paint folder into your paintschemes/skin folder. Thank you for a exellent Plane. Looking great, Thanks to all involved and of course for sharing with us. Many thanks for this very interesting addition! Is this compatible with UltraPack 3 ? I don't know exactly where to put the files, I've tried in #UP# folder, inside and outside of STD folder. Running 4.10.1 ModAct 3.2. Runs great! Thanx for this swell addition. A thousand thanks for this fine little bird! I LOVE it!